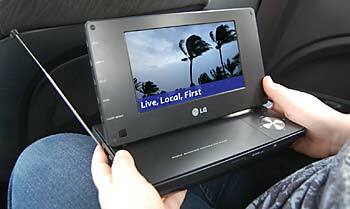 This prototype from LG combines a digital television with DVD playback and a Mobile DTV tuner for viewing on the go. Despite all the hype about televisions' being turned off in droves in favor of Hulu and YouTube, live TV remains easily the most popular entertainment me­­dium (just look at the ratings for American Idol or CSI). Still, in an effort to reach the iPhone generation, the broadcast industry is pushing Mobile Digital Television (Mobile DTV), a technology that lets you watch TV programming while you walk in a park or ride in a car barreling down a highway. I took several Mobile DTV gizmos for a test drive and was impressed by the technology's video quality, plus its versatility in integrating with a wide array of devices. The Mobile DTV broadcasting standard comes from the Advanced Television Systems Committee (ATSC). Industry observers expect a slew of Mobile DTV-compliant products, from cell phones to laptops, to emerge this year. In my tests, I tried three Mobile DTV prototype de­­vices: a portable DVD player, a cell phone, and a credit-card-size tuner for playing Mobile DTV on de­­vices such as the Apple iPad and various RIM BlackBerrys via Wi-Fi retransmission. Vizio will offer three Razor LED 1-inch-thick Mobile DTV models priced from $150 (7-inch screen) to $230 (9-inch screen). The Mobile Digital TV era actually dawned last year, when U.S. television stations switched from analog to digital broadcasts. The move to digital broadcasting freed up wireless spectrum for TV stations, allowing them to offer subchannels designed specifically for in-transit viewers. Those channels broadcast in a standard-definition, wide-screen format optimized for smaller screens. As a result, local affiliates can broadcast the same programming to homes and to mobile devices simultaneously. Best of all, Mobile DTV (like regular over-the-air broadcasts) is free. By late spring, according to the Open Mobile Video Coalition trade group, some 30 stations will be broadcasting in the new format. Among the stations in this pioneer group are seven in the Washington, D.C., area, including the region's NBC affiliate. Another 700 or more U.S. stations (out of the roughly 1600 local broadcasters overall) plan to offer Mobile DTV broadcasts by the end of 2010, the OMVC says. Inevitably, the new standards demand new hardware with new tuners to pull in the broadcasts. But Mobile DTV tuners are so inexpensive that they don't significantly raise the price of a handset. In contrast, satellite-based television systems-such as MediaFlo TV, designed for car backseats-have been around for years, but require professional installation of bulky, expensive (up to several thousand dollars, not counting the monthly subscription fee) hardware in an SUV or minivan. Furthermore, the picture attainable on mobile satellite systems tends to break up in urban environments. Since Mobile DTV tuners are small enough to fit into a cell phone, manufacturers can put them in many different portable devices. The three prototype Mobile DTV products I tested were an LG portable TV/DVD player, an LG KB770 cell phone, and a Valups Mobile DTV Wi-Fi Receiver. In the New York metropolitan area, the only test channel available at the time of my hands-on review (February) was one operated by ION Media Networks. The test station's content consisted of re­­broadcasted children's programming and CNBC news, and ION warned me that the channel's transmitter was less than ideally located. Nevertheless, I was surprisingly entertained. 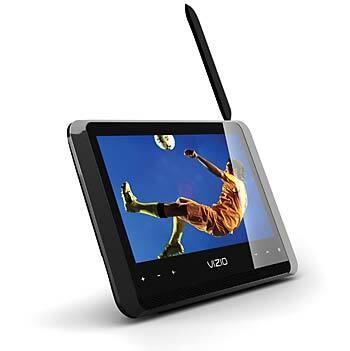 I could view uninterrupted programs on the LG smartphone as I walked down the street, or on the LG DVD player as I rode in the backseat of a car. The credit-card-size Valups Wi-Fi adapter tuned in to the test channel at a restaurant and displayed it on my iPod Touch well enough to keep my daughter happily diverted. 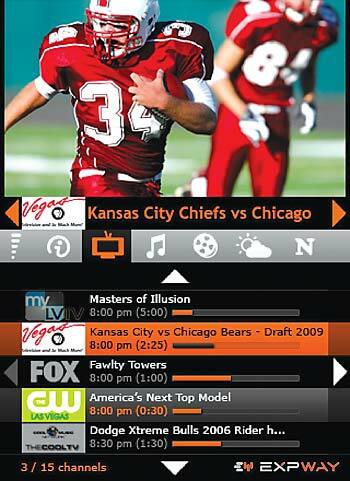 The TV interface on a Mobile DTV device may look something like this. Like broadcasts from regular television stations, Mobile DTV channel broadcasts have a limited range. In the case of the New York test station (WPXN), I could receive a signal only within a radius of about 10 miles from the broadcast tower. When Mobile DTV stations go live, however, reception supposedly will be possible even at distances of 20 to 40 miles. This is welcome news for travelers who find themselves delayed in airport lounges, though passengers whiling away time on long car trips will still have to change channels repeatedly. Mobile DTV's main rival is the Qualcomm-backed Flo TV service. Flo TV is available on several smartphones (the $200 LG Arena, for example) and on the $250 Flo TV Personal Tele­vision. But the service costs $10 to $14 per month (de­­pending on the device and the carrier), it delivers fewer than 20 nationwide channels, and the channels are available only in metropolitan areas. That's because Flo TV relies on its own network of transmission towers to broadcast programming in some of the space that was left vacant when television stations switched from analog to digital. Consequently, even though Flo TV programming is nationwide, the network itself is not. In the hinterland, you'll lose the signal. Eventually, we may see devices that support both Mobile DTV and Flo TV. Both LG and Samsung have demonstrated cell phones with Mobile DTV, and both offer handsets than can re­­ceive Flo TV. Much depends on what cell phone carriers like AT&T and Verizon de­­cide to do, since they control which handsets work on their networks; currently, both companies charge a substantial fee for cellular-network-based video, and free Mobile DTV could cut into their revenue from that source. Meanwhile, some Mobile DTV broadcasters are looking at the possibility of offering additional for-pay channels that could induce wireless carriers to add Mo­­bile DTV to their handsets. No matter what the cell phone situation for Mobile DTV looks like a year from now, tuners are slated to appear in many products over the next eight months. Dell has already announced plans to market a netbook with Mobile DTV; and Panasonic and a number of other major consumer electronics companies have voiced support for the standard. When finished products reach store shelves this summer, we'll let you know how they fare in formal testing.